Lophophora echinata is one of Léon Croizat’s creations. It is not a good name despite my commonly using it for a peyote occurring in the Trans-Pecos. I’ll apologize in advance for that and promise I will find an alternative as soon as possible. As we explore this name it is a good idea to keep Croizat’s decipiens in mind as both names may well be referring to the same plant, at least when invoking the name as it was viewed by Del Weniger. More comments will be found under L. decipiens. “Lophophora echinata sp. nov. typica var. nov.
Planta viridi-glauca, culta saepius ad 10-13 cm. lata, unicipite. Podariis 5-6-lateris, conicis, in costis veris haud confluentibus ca. 2-3 em. longis latisque, late longitudinaliter conniventibus, eximie penicillatis. Flore in anthesi ca. 2-2.5 cm. lato, albido ca, 2-2.5 cm. longo; laciniis externis ca. 3-seriatis, apiculatis, pallide-viridibus demum saepius dorso brunneo-costatis: laciniis internis in serie duplici ca. 30; staminibus numerosis, filamentis albidi , antheris pallide luteis, parvis; stylo ca. 10-13 mm. longo, albido, apice in stimgatibus [SIC: stigmatibus] ca. 7 partito. Fructu elongato subtereti ca. 1-2 cm. longo, saepius pallide roseo, perianthii reliquis caducis. Semine generi. Notice that an *illustration* was designated as the Type for Lophophora echinata Croizat. That photograph was from Schultes 1937 (also 1938 & 1940). Much confusion is referrable to here. The most famous of course is Croizat’s echinata. 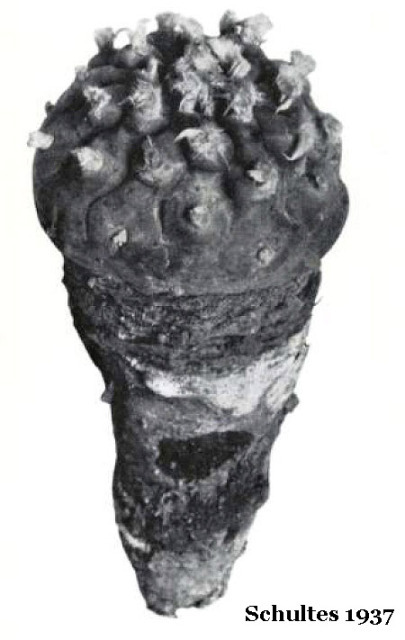 In the previous edition of this work I, for reasons still unclear to me, had erroneously believed that Croizat referred to something different due to his odd designation of a photo of Schultes as his type, a locale of Texas assigned by Bravo and the brief appearance of L. williamsii var. echinata Bravo. 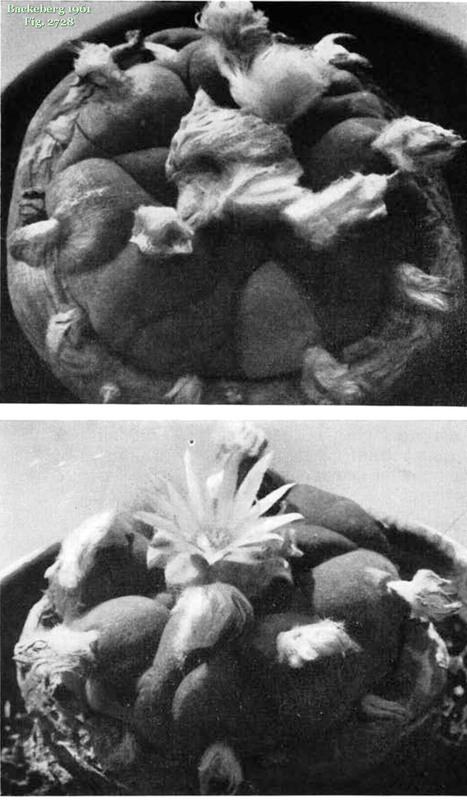 These had lead me to conclude that what Leon Croizat and Del Weniger called “echinata” were referring to the same plant (Croizat as a species and Weniger as a variety of L. williamsii.) I now doubt that. It is still not clear to me just what the story is on the motivation underlying origin of Croizat’s echinata. Croizat had designated yet another photographic image as a Type specimen, this time of that of the peyote shown above; published by Schultes in 1937. 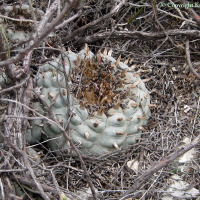 Schultes plant looks like a typical williamsii from South Texas, Schultes article was mainly on peyote use by NAC members, and its white flower could be natural in occurrence even if unusual. 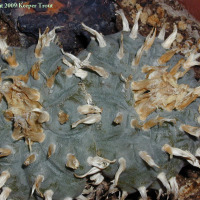 Croizat next started a lasting mess when creating “diffusa” and placing it as a variety of Lophophora echinata. 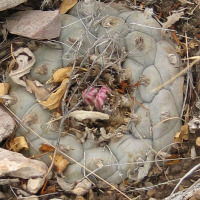 Bravo compounded it when soundly elevating Lophophora diffusa to being recognized as a species in its own right but recognizing echinata temporarily as a variety of Lophophora williamsii. 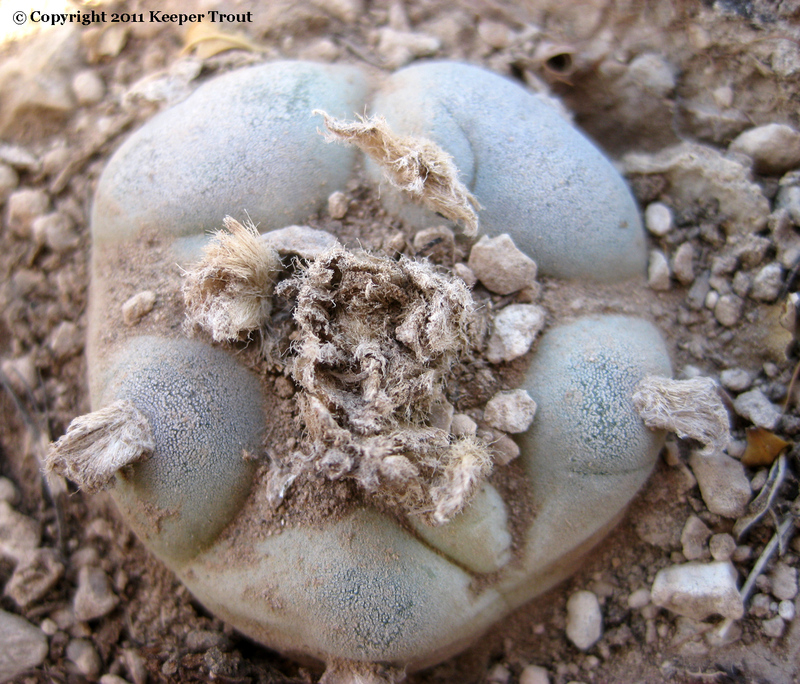 Backeberg took it a step further when largely respecting Bravo’s Lophophora diffusa in name but then creating Lophophora lutea for what was clearly Lophophora diffusa from Queretaro. Perhaps it also reflects the disdain many growers have for trinomials, leading to many plants in horticulture that were originally named L. echinata var. diffusa being renamed L. echinata. Most of the plants grown in Europe (and maybe most elsewhere) as L. “echinata” are for this reason L. diffusa although it is also clear that there is plenty of what we will be referring to as L. williamsii echinata sensu Weniger in Europe. What is being discussed here as Lophophora williamsii echinata is sensu Weniger rather than sensu Croizat This plant is actually fairly well represented in European horticulture for a couple of reasons, one (according to Bohata and coworker’s wonderful Lophophora special issue of Kaktusy) is that its greater cold tolerances have enabled it to survive heating oil shortages and other winter problems experienced by European cultivators better than a typical L. williamsii. The other appears to be a partial overlap with what was being sold as Anhalonium Lewinii during its early years when the commercial plant collectors must surely have been scrambling to fill the demand created by Hennings’ Frankenstein (A. lewinii is discussed in more details elsewhere here). Weniger’s echinata is discussed in more details in the entry for L. williamsii and is not otherwise seperated from it. I’m still at a loss, however, to know just where and how Croizat’s name echinata came to be associated with Weniger’s view of this name. Bravo seems to be the bridge but eventually she did not agree. I’m presently only guessing that she ran into the same problem as everyone else; peyote is so variable that the ranges of features between populations overlap. Most noteably Croizat described a plant with white flowers and the body as being glaucous-green, 10-13 cm in diameter, having having 5-6 podaria not organized into well defined ribs (“in costis veris haud confluentibus”). 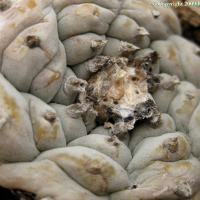 This is often mistakenly assumed to be Lophophora diffusa due to the white flowers. However that conclusion seems erroneous without more information being included. 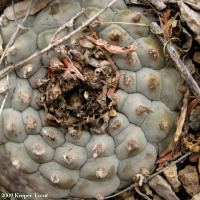 In contrast to that, or to a typical Lophophora williamsii, Weniger’s “echinata” is a sometimes larger (sometimes up to 5″ in the longest direction) and more greyish form of Lophophora williamsii that occurs in west Texas, Chihuahua and part of Coahuila. It occasionally has rhomboid tubercles with spiral or indistinct ribs. Pink flowers with pink midstripes are common. Both the body and the flowers are more commonly slightly oval rather than round. Sometimes this is extreme when growing in cracks in rocks. Weniger’s “echinata” is also far more cold tolerant than a normal Lophophora williamsii and this difference has been commented on by cactus growers in Texas due to hard winters preferentially killing only the typical form. White flowers are more common on other Lophophora species including diffusa but can and do sometimes occur on L. williamsii. I won’t say it can’t happen but so far I have not seen white flowers on L. williamsii echinata sensu Weniger. While the bottom line is the name should be disposed of, the plants which have been known by that name are quite remarkable and merit more intensive cultivation. 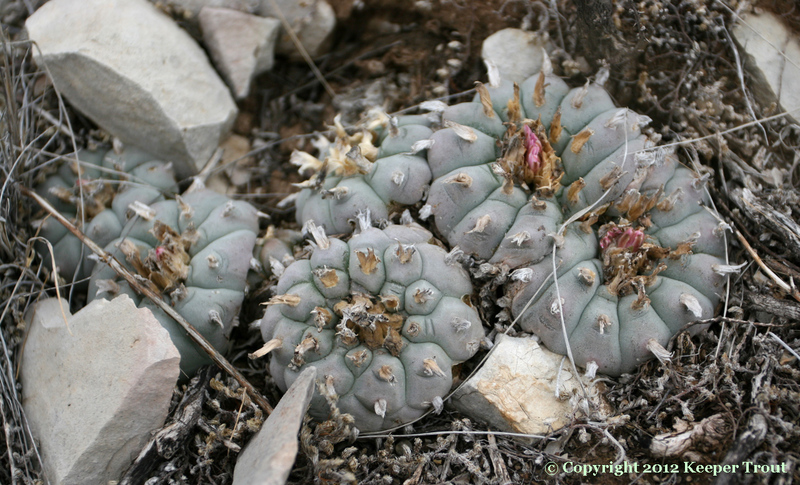 These extremes would have killed most if not all of the more typical Lophophora williamsii. Perhaps Croizat had more information than he included. He did have access to the Harvard herbarium where the dried flower of Schultes photographed plant was said to still exist. 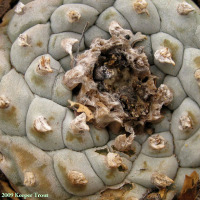 Its strange he did not mention more than that when designating Schultes photo of that plant to be the type for Lophophora echinata. It is one of several “species” Croizat names based on photographs and has what feel like oddly abbreviated descriptions so it seems peculiar that this work has been received with the respect it has. Even more problematic, no locale was included by Schultes or by Croizat. Bravo 1967 (& 1968) reduced the rank of echinata to a variety of williamsii but essentially added nothing to Croizat’s details about the plant itself. She did add Texas as the place of origin for Croizat’s plant citing Zhender as her source of information. This seems probably to be in reference to J. & B. Zehnder and their company Kaktimex; the Swiss cactus house that was active in Mexico during the period of Bravo’s work on this. How Zehnder (or Zhender) would have known anything about the origin of Croizat’s plant might be questioned but may have just been a logical inference made by someone questioned by Bravo. This author would assume that as well, especially as Schultes was writing about drug use of peyote in those papers so including an example of a typical drug plant peyote as used by the NAC is very likely. As would be his using something that was present in Harvard’s collections. Bravo includes reference to Schultes’ photo as an illustration of Lophophora williamsii var. echinata (Croizat) Bravo and adds another example in the form of a reference to a photo in Thompson. 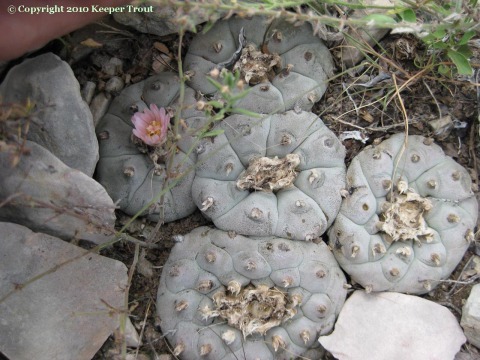 She does not mention having collected it herself or having ever observed it in the field but elsewhere does mention a number of collections she had made including one at a location in West Texas where any Lophophora she encountered would have been Weninger’s “var. echinata”. By her next publication on the subject L. williamsii var echinata Bravo is further reduced to becoming just a note in the synonym list under L. williamsii. So far no reason has been located in print but Croizat’s type might be mentioned again. Schultes used this same photograph in 1937, 1938 and 1940. The available copy of Schultes 1937 is the most clear and provided the view that is included. If I were Bravo, or anyone else who was familiar with peyote, I’d hazard a guess the plant in this picture came from south Texas or Mexico. Bravo also preserved the flower color given by Croizat. She too says white (blanca) but does not mention examining material so it seems likely she is just repeating Croizat. White flowers are certainly known occasionally from south Texas plants but the petals are far more often white with a pink stripe or some shade of light pink bearing a darker midstripe. 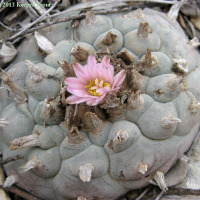 Bravo does however give pink as the flower color for Lophophora williamsii var decipiens Croizat. I just can’t seem to get free of decipiens yet. It might be logical to *want* to equate decipiens here as Backeberg did when he assigned decipiens as the pink flowered Lophophora williamsii var. decipiens. The form responsible for making decipiens noteable is certainly common enough in “echinata” sensu Weniger. A potential problem point needs to be kept in mind in that as “decipiens” is also not at all uncommon in both Lophophora fricii and in Lophophora diffusa. Just for hopes of some clarity, or perhaps in this case to lose any delusions of it, let’s return to Croizat and remind that his Lophophora echinata bearing white flowers suggests it needs to at least potentially incorporate diffusa; along with fricii and williamsii as both of those sometimes flower white. There are a number of interesting early instances scattered through MfK where the authors used “lewinii” to refer to what *now* seems to be echinata/decipiens (with pink or white blushed pinkish with pink striped flowers) before history redirected “lewinii” to Lophophora diffusa with white or yellow flowers. While I have not been able to learn how Croizat’s echinata got transformed beyond Bravo’s echinata into Weniger’s view of echinata it is easy to see why Weniger might want to attach the name echinata since many of the plants can be rather spiky looking. Reading Croizat and assuming that any of his plants fit Weniger’s echinata, decipiens would appear to be the most likely candidate. This particular material appears to represent a form or forms of Coahuilan L. fricii and/or williamsii that is in need of futher work; hopefully with an eye for disentangling it from the mess currently surrounding the name decipiens. At least a couple of the Mexican L. williamsii populations shown in Bohata et al. 2005 appeared to have a higher frequency of this form and merit more study. It ideally needs be referred as something else or at least be clarified to as being discussed as echinata sensu Weniger.